Have you ever experienced an epiphany, a life-changing moment or realization? Elise Ballard has, and she was so stunned by its effect on her life that she started asking others if they had ever experienced these kinds of breakthroughs. What began as simple curiosity led to an unexpected and exciting journey, spanning several years and the breadth of human experience. The result of her interviews is Epiphany, a collection of more than fifty revelations that changed lives forever. 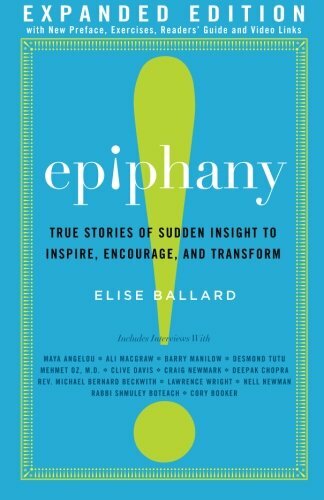 Inspiring, thought-provoking, and eye-opening, Epiphany shares deeply intimate stories of people from all walks of life, from public figures like Maya Angelou, Deepak Chopra, Ali MacGraw, and Barry Manilow, to personal acquaintances and lifelong friends, to new contacts made in the most unexpected and serendipitous of circumstances. Whether discovering purpose in life, awakening to new possibilities, or finding a new direction after a catastrophic setback, each person’s epiphany is a gift, providing new insight into these remarkable lives and a window into the universal truths that connect us all.